Our basic materials, which are used for the production of our finished goods, are cross-examined over diverse aspects in order to ensure its excellent quality. The checking is done by our experts. From mass to retail requirement fulfillment, we can do it all. Our organization has a widespread trading system to offer our patrons with the goods all year round and make the scheduled delivery. 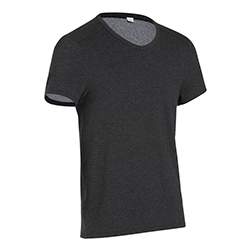 WB-1705 Sports Round Neck T-Shirt is made of the finest quality fabric and is available in different color options.